Tumblr will be making a big splash in New York's Times Square, taking over Hyundai’s massive billboard today as part of its ambitious World Cup sponsorship campaign. It’s the first time the social blogging site has ventured to the Crossroads of the World; the goal is to target avid sports fans who are digitally inclined but may not be Tumblr users. "There’s something interesting in the fact that we’ve built this site, but it’s going to have a certain percentage of people that come there just because the content is good and they want to engage with it," said Tom Pettus, vp, creative director at Innocean. 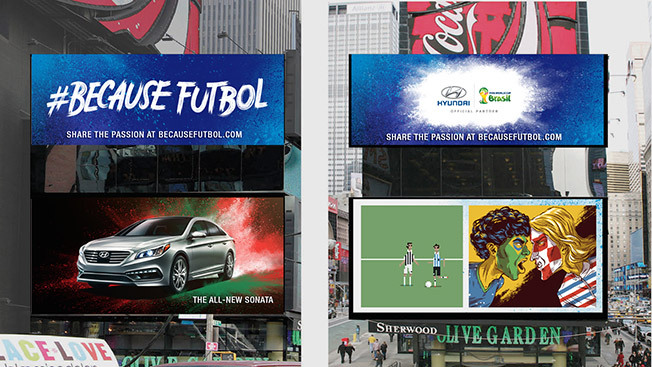 Hyundai’s digital World Cup campaign centers around a Tumblr-powered microsite and includes a set of 120 pieces of original art that will be rolled out by the car brand during the course of the month-long tournament. Roughly three-fifths of the content will be created by six Tumblr influencers—or artists—and the remaining portion of creative will come from Innocean team members (Hyundai’s agency and brainchild behind the Tumblr initiative) and design studio ilovedust. Hyundai is also adding two new features to the microsite site today. In 12 cities, fans can use a feature called "where to watch" to find nearby places to tune in for the games. Memes are also a big push with a new tool that lets users remix an existent piece of artwork or create their own that can then be shared across social media. The content itself is tailored towards specific countries (the U.S., Mexico, Spain, Brazil and England are all top priorities) and the effort includes real-time and planned posts. For example, posts related to the teams that are competing in the opening matches has already been created and will be rolled out to time with the games. But, artists will design pieces of art on the fly, too. “We might see a thread that we feel is relevant and would resonate with the audience, and then we’ll work with that artist and say, 'alright, we want to jump on this particular topic,'" Innocean’s Pettus explained. Hyundai plans to use a bunch of different types of content including reaction GIFs, quotes, illustrations and short-form video within the site. While Tumblr is at the heart of the campaign, Hyundai’s global sponsorship of the games also includes retail, social, point-of-sale and television activations. The Tumblr artists are paid, but the blogger site's execs declined to discuss how much. Hyundai has also run influencer programs on Instagram, Twitter, YouTube and Facebook, but the decision to push Tumblr is interesting since Vine and Instagram seem to be generating the bulk of interest from marketers around influencer programs. Part of the reason why brands are prioritizing Instagram and Vine over Tumblr is because the latter is not as visually driven for storytelling, per Matt Witt, evp and director of digital integration at Tris3ct. "The Tumblr influencer model has yet to hit its full stride because there is more emphasis on storytelling [on other platforms] than a Tumblr user offers."